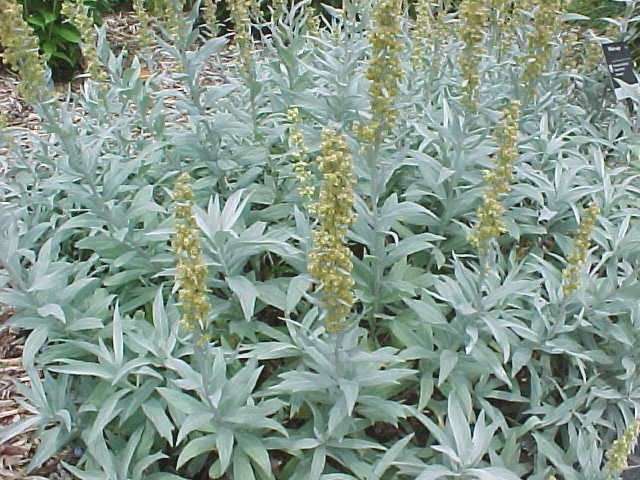 Artemisia ludoviciana is a perennial herb, 30 cm to 1 m tall, colonial from rhizomes; stems white wooly-hairy, unbranched below inflorescence. Leaves alternate, 3-10 cm long, 1 cm wide, lance-shaped, entire to toothed or deeply lobed, white-wooly on both sides, or green above. Flowers greenish, very small, in compact heads that arise from a bract-covered floral base (receptacle) about 0.3 cm tall, flowers tubular, radially symmetrical (disk flowers) 0.2 cm long; inflorescence branched. Fruit: dry, 1-seeded (achenes) small. Origin: Western and Midwestern US. Notes: This is the only listing found for this plant.